Takeout Chinese was something we did at least once a month before moving back to Boise. Since moving back we haven’t really found that diamond in the rough that serves healthy, delicious Chinese made with really fresh ingredients. If you know of one do tell. We have had better luck with Thai. The great thing about not finding this kind of food is that it has doubled my determination to learn to prepare really good Chinese food. Over the years I have had lessons with people from all over the world sharing their best family recipes. One of the most healthy and simple recipe I have enjoyed regularly is this Moo Goo Guy Pan Recipe. It takes about 20 minutes to make and is full of fresh vegetables. We serve with rice, salad or spring rolls and if the kids get their way some kind of orange or mandarin chicken. 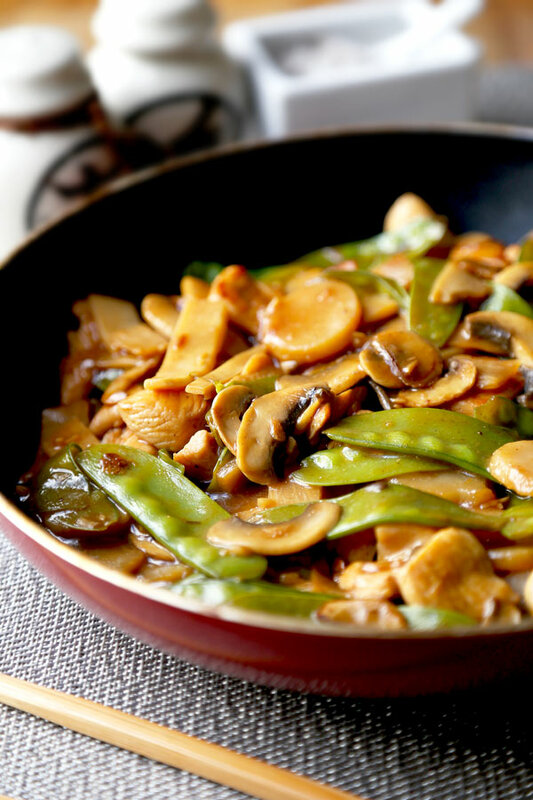 The literal translation for moo goo gai pan is button mushrooms, chicken, slices. Pretty spot on uh? A simple name for a simple stir fry. Enjoy! Notes: I like to add 1/2 cup celery and 1/2 cup matchstick carrots, but this is not original to how I learned to make the dish. 1. In a pan over medium high heat, add peanut oil, garlic and chicken and cook for 5 minutes, or until chicken is cooked through. Transfer chicken on a plate and set aside. 2. In the same pan add mushrooms and snow peas and cook on medium high heat for 5 minutes. 3. Add bamboo shoots, chestnuts and chicken and cook for 2 minutes. 4. Add ingredients for the sauce and stir. Add cornstarch and water mix and stir until sauce thickens. 5. Turn the heat off, season with ground white pepper and serve immediately. This entry was posted in Carrot, Celery, Chicken, Garlic, Ginger Root, Mushrooms, Peas and tagged farm fresh food, healthy chinese, healthy food, stir fry, take out copy. Bookmark the permalink.